Known for its wonderful chocolates and gourmet cuisine, the Flanders region of coastal Belgium is rich in culture and natural beauty — windmills, meadows, marshes, sandy beaches and bustling cities replete with Gothic architectural grandeur. Evidence of the past is everywhere on canal boat holidays in Flanders whilst you encounter one looming castle after another! Flanders reveals its history and heritage in its abundant cathedrals and palaces. Whilst you’re in Gent, admire the Cathedral of St. Bavon. Ascend St. Michael’s Bridge for fantastic views of the mediaeval city. Ypres, also spelled as “Leper,” is famous for its World War I museums. The gorgeous beaches of Neiuwpoort and Oostende draw thousands of travellers every summer for fun in the sun on the North Sea. Take a dip in the surf and then relax at a waterside bistro! Linger at a refreshing lake on your riverboat cruises in Flanders! Flanders gastronomy will tantalise you! Try vlaamse stoofkarbonaden stew, a favourite in Belgium. It’s a lot like beef bourguignon, but it’s made with beer instead of red wine. Or try konijn in gueze (rabbit prepared with gueze beer). And don’t forget the world-famous pralines chocolates for dessert! Have fun with the kids at Bellewaerde Park in Ypres with its amusement rides and rare animals. Brielmeersen Park in Deinze features mini golf and a bamboo labyrinth! The kids’ll also love the beach and munching too much chocolate on Flanders river cruises in Belgium! Belgium is famous for its beers — champagne, lambic, tripel, dubbel and more! Try a Flemish red on your beer tasting holidays in Flanders! The Straffe Hendrik Brewery in Bruges offers tours and tasting, and the Dulle Griet Bar in Gent has a menu of 250 brews! When you choose a boat hire in Flanders, Belgium, you embark upon a fantastic voyage into a land of the sea. Canals and rivers lace the beautiful coastal lowlands, a haven for seabirds and beachgoers. In fact, there are about 1,570 kilometres (975 miles) of waterways used for business and pleasure. The water is so much a part of Flanders that it seems arched bridges crisscross every city. Indeed, Gent boasts more than 200 of them! 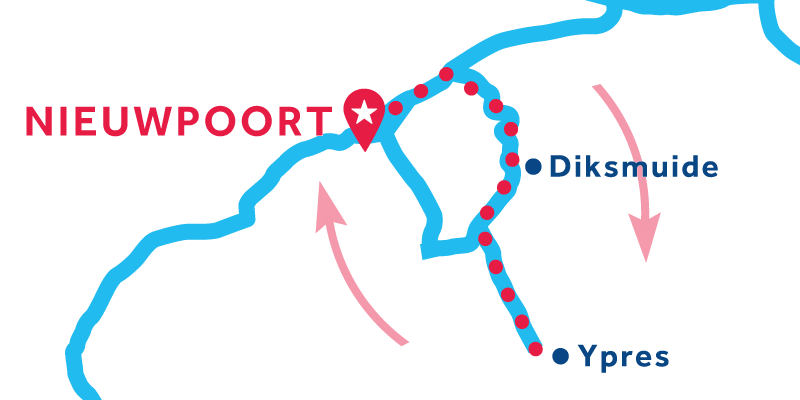 Your boat hire in Flanders takes you along the coast with its dunes and dikes. The North Sea air invigorates as you indulge in delicious seafood and a Belgian brew at oceanfront cafés. Ports like Oostend combine international business with resorts for travellers. You’ll reach Gent via a ship canal built in 1886, just one of the waterways that make Belgium cruising so special. According to some sources, there are 470 castles in Flanders, and 50 of them are ensconced around the cosmopolitan city of Bruges, a locale with more than 80 bridges and multiple canals. Indeed, it is said that Bruges so reminded travellers of Venice, Italy, that it came to be called the Venice of the North. When you go, you’ll see why! For a time, the waterways of Bruges and its access to the sea made it the busiest trading city in the world and the wealthiest in Europe! Navigating in Belgium is easy. The waters of Flanders are suitable for beginners. Take a look at our waterway and lock closures page to keep up to date with the cruising conditions across all of our regions. Lock keepers and bridge tenders operate all locks and lift bridges, the fee has been paid by Le Boat. Please be aware of the lock closure dates by local authorities. During that day(s) / time(s), you won’t be able to go through the locks. For more details and questions, please contact our sales team. All Locks/Bridges closed on EASTER Sunday. 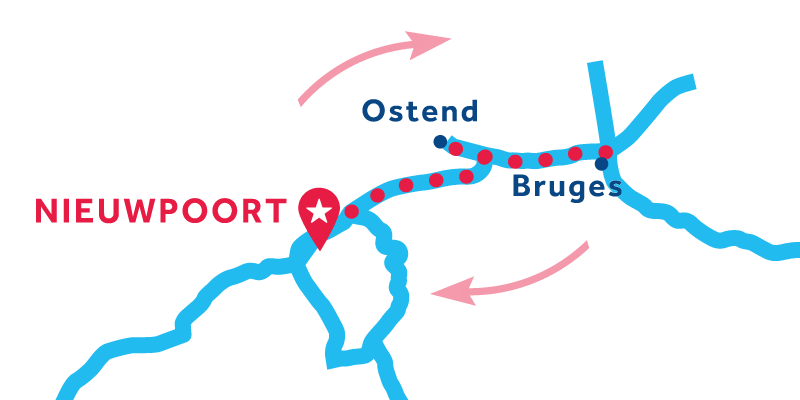 Monday to Saturday all bridges of Brugge are closed between 7h30-8h30 and 16h30-17h30. On Wednesdays: 11h50 to 12h30 as well. Locks in Bruges are also closed on Sundays in April and October. Pass through locks/bridges in flotilla. If you are cruising in the area of the North of France (3 weeks or more) you will be required to buy a “pass” to go through the locks. 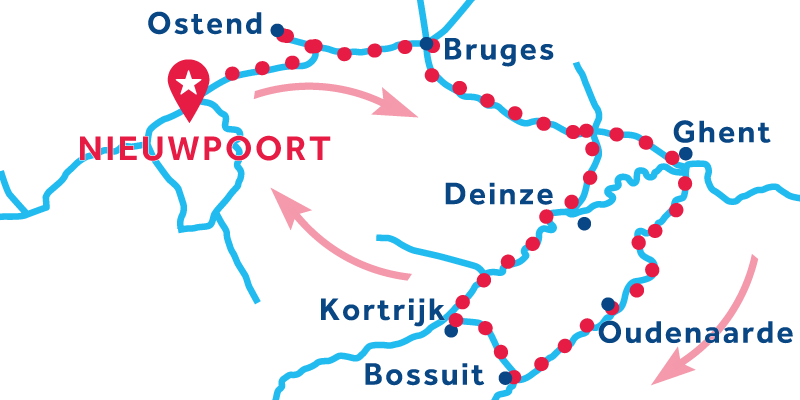 In and around Bruges: no service on Sundays in April and October. If you are going to visit Bruges, follow the Ring Canal around the outskirts of the city, and moor safely in La Coupure, a canal inlet protected by a barrier that is lifted by the harbour master. There are mooring fees (approximately 10 euros per night). Moorings are plentiful in Belgium. Running costs (diesel, gas, engine wear and tear) - charged by the engine hour (by the litre in Scotland). We've produced a handy PDF guide for this region to give you an overview of all the stops and things to do along the waterway. Nieuwpoort is a lively and cosmopolitan city on the seaside, popular with families and has a 2 km long promenade. Take a walk along the beach, and feel relaxed by the wind and the sound of waves. A pretty town to have a break. Veurne is a welcoming city with the characteristic local architecture. Visit the church of Sainte-Walburge and its garden, the city hall, and the pavilion of spanish officiers. In Diksmuide, you will enjoy visiting the gothic church of Saint-Nicolas, especially La Pièta, behind the City Hall. Other great sites include the beguine and the Yser Tower in Diksmuide. Ieper is a beautiful and welcoming city full of history. The "Hall aux draps" is a beautiful building worth visiting and don't miss the zoo in Bellewaerde Park. Ostend is a big city on the seaside whose history is built around intensive fishing. You can visit several monuments here, like an old stronghold built by Napoleon. Take time to visit the museums, and have a bite at one of the nearby restaurants. The architecture in the medieval centre of Bruges, a UNESCO World Heritage Site, makes this city one of the most popular tourist destinations in Europe. Small enough to explore on foot, by carriage or canal boat, there are many museums to see, along with good restaurants and shops. Ghent, the pearl of Flanders, was once the largest city in Europe after Paris. No other city in Belgium has as many monuments and important buildings as Gent. The historic center is ideal to explore on foot - take your camera though! Deinze is a delightful little town with many shops and attractions.The Brielmeersen Park has beautiful footpaths, along with a large children's playground, mini-golf and a giant bamboo maze. Oudenaarde is famous for its carpet weaving and tapestry. You can discover this history in details at the museum, in the factory fabric exhibits typical tapestries. The Broodstraat, Nederstraat, Einestraat and Hoogstraat are the main pedestrian streets that have kept all the charm of the old medieval streets. Bossuit is a charming little village where you will enjoy a walk and a visit to the old castle, built in the 17th century. Kortrijk is a beautiful and historic city, where you will discover the Broel towers - among many other buildings and monuments that make up this town's magnificent local architecture. To help you get an idea of how far you can travel in the time you have, here's a selection of routes to and from our bases in this region. You dont have to stop at all the places listed or follow the route exactly. So long as you return your boat to your end base by the date you've booked - you're free to enjoy your cruise however you like. For a comfortable pace, allowing you time to regularly stop and explore, we'd recommend an average of 2 - 4 hours cruising each day. You browse in the chic boutiques in Gent, explore the castle, and then continue on your way, feeling content in the embrace of the scenic Belgian countryside. It seems every town tempts you to stop and shop! Your Belgium river cruises eventually bring you to Oudenaarde, famous for its tapestry making and good restaurants. After dinner, you seek out Belgian brews! Nieuwpoort: Nieuwpoort is a lively and cosmopolitan city on the seaside, popular with families and has a 2 km long promenade. Take a walk along the beach, and feel relaxed by the wind and the sound of waves. A pretty town to have a break. Ostend: Oostende is a big city on the seaside whose history is built around intensive fishing. You can visit several monuments here, like an old stronghold built by Napoleon. Take time to visit the museums, and have a bite at one of the nearby restaurants. Bruges: The architecture in the medieval center of Bruges, a UNESCO World Heritage Site, makes this city one of the most popular tourist destinations in Europe. Small enough to explore on foot, by carriage or canal boat, there are many museums to see, along with good restaurants and shops. Deinze: Deinze is a delightful little town with many shops and attractions.The Brielmeersen Park has beautiful footpaths, along with a large children's playground, mini-golf and a giant bamboo maze. Kortrijk: Kortrijk is a beautiful and historic city, where you will discover the Broel towers - among many other buildings and monuments that make up this town's magnificent local architecture. Bossuit: Bossuit is a charming little village where you will enjoy a walk and a visit to the old castle, built in the 17th century. Oudenaarde: Oudenaarde is famous for its carpet weaving and tapestry. You can discover this history in details at the museum, in the factory fabric exhibits typical tapestries. The Broodstraat, Nederstraat, Einestraat and Hoogstraat are the main pedestrian streets that have kept all the charm of the old mediaeval streets. Ghent: Ghent, the pearl of Flanders, was once the second largest city in Europe after Paris. No other city in Belgium has as many monuments and important buildings as Gent. The historic center is ideal to explore on foot - take your camera though! Belgium river cruises transport you deep into the past. Fascinating museums reveal archaeological, artistic and even culinary history, such as the Museum of the Bakery in Veurne. Ypres and Diksmuide feature Belgium’s bloody World War I history. As you cruise, the peace of the present serenity on the water captivates you, regardless of the tumult of the past. Veurne: Veurne is a welcoming city with the characteristic local architecture. Visit the church of Sainte-Walburge and its garden, the city hall, and the pavilion of spanish officiers. Ypres: Ypres is a beautiful and welcoming city full of history. The Hall aux draps" is a beautiful building worth visiting and don't miss the zoo in Bellewaerde Park. Diksmuide: In Diksmuide, you will enjoy visiting the gothic church of Saint-Nicolas, especially La Pièta, behind the City Hall. Other great sites include the beguine and the Yser Tower in Diksmuide. Your mouth waters as you and your friends haunt a candy store in Bruges, the capital of West Flanders. The fragrance of chocolate fills the air, and you surrender to the urge to indulge! Belgium captivates you as you travel through beautiful country settings into mediaeval cities like Ghent with its impressive Gothic architecture. You marvel at the network of waterways that lace inland away from the sea. The cruise options seem limitless as you leave the golden beaches of Nieuwpoort behind and head out bound for Bruges, the Venice of the North, on wonderful river cruises in Belgium. Almost immediately you’re struck with the country’s cosmopolitan charm — elegant castles, pretty bridges, and waterside cafés galore! The buglers gather before you under the Menin Gate Memorial in Ypres, and you listen as they play the Last Post to honour the soldiers who died in World War I. The bugling has been a tradition since 1928, and you find it moving. Flanders river cruising is like that. The past emerges at every turn in historic cities, looming castles and waterfront bistros where you sip a Flemish red! Nieuwpoort is a lovely seaside town where you can have a walk and taste seafood speciliaties in front of the sea. Then cruising to the South, you'll discover the history and patrimoine of Belgium in the charming towns of Diskmuide and Ypres, famous for its museums and its World War II monuments. Don't miss to try some chocolates and local beers along the way ! 4TH TIME BOOKING. HAVE BEEN TO HOLLAND, SCOTLAND AND VENICE AND NOW BRUSSELS. EXCELLENT SERVICE, BOAT EXPERIENCE, AND TRIP. IF ANYONE LIKES A LITTLE ADVENTURE AND EXCITMENT, THIS IS THE WAY TO HOLIDAY!! DR. JOHN A. HARDY GREAT ALL AROUND, WILL GO AGAIN! Thank you for your review and for your loyalty. We are so pleased you've enjoyed so many amazing destinations! very informative, friendly staff and always helpful staff were very helpful, friendly and informative, our boat trip was very relaxing and beautiful scenery. Our Le Boat was very comfortable. Excellent! Very helpful and friendly. Excellent. Lovely boat, great holiday. Thank you very much for taking the time to share your feedback. We are delighted to learn you enjoyed your cruise with us in Belgium. Sent us out with the diesel heat not working, but tried to repair while we were on route. Only had a small electric heater that seemed to blow the breaker when plugged into shore power. Steven the mechanic tried his best, and kept us entertained with his sense of humor. If it wasn't for him, we wouldn't have stayed so happy. As far as a canal boating destination, out of 3 canal boating trips we have taken, this was our least favorite cruising location. Too regimented waiting for opening bridges. Brugge and Ghent were fabulous. Friendly staff, keen to help us make the most of our trip and showed complete novices the ropes in as practical a manner as possible without being over burdensome. As complete novices we were somewhat nervous to begin with but the kind helpful staff at the Le Boat, Niuewpoort soon put those nerves to rest. We had a thoroughly enjoyable 4 day trip (3 nights on the boat) and would highly recommend it to any (older) families who are after a different means of seeing Belgium. The introduction was very comprehensive. Route details were clear. Everything worked. Remote location a bit tricky to get to without a car, but a very nice marina with all the amenities. People at the base was very helpful and friendly! The boat was in a good condition and we really enjoyed the trip to Brugge and back. It was a little too short though as we thought that we could leave right after the introduction and could only leave the following morning - I think you should inform people about that on the internet. It was a good experience to enjoy with the family. I would recommend a longer stay as it was a bit expensive for such a short stay. The funtioning of the boat was good except the thermocouple was bronken in the oven, and therefore it and the broiler would not stay on. The heat in the boat didn't work even with shore power. It would have been terrible if it had gotten colder. 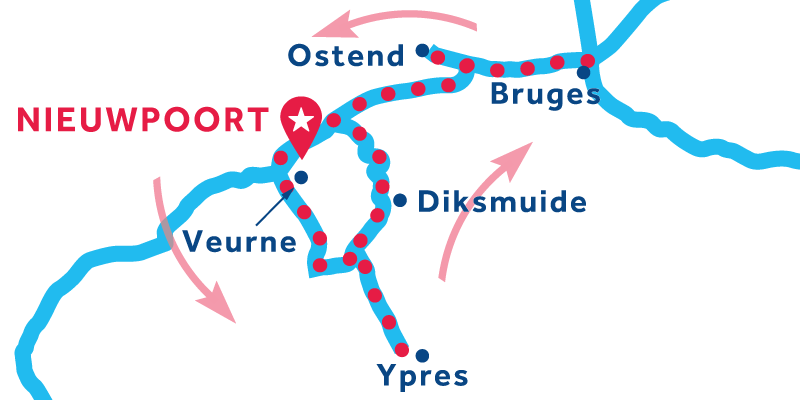 Although most all boats leaving Nieuwpoort, travel towards Brugges, there was incorrect information in the book about when an important bridge would open on the way to Brugge. It only opened at 11:00 and 3:00 and because we did not know this it cost us spending the afternoon visiting Brugges. 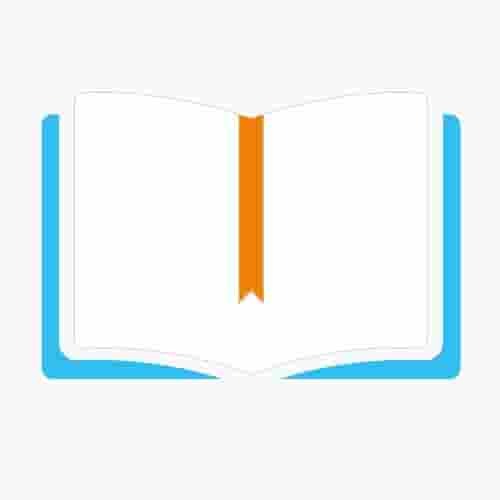 Other information about openings of bridges was incorrect in LeBoat's book. 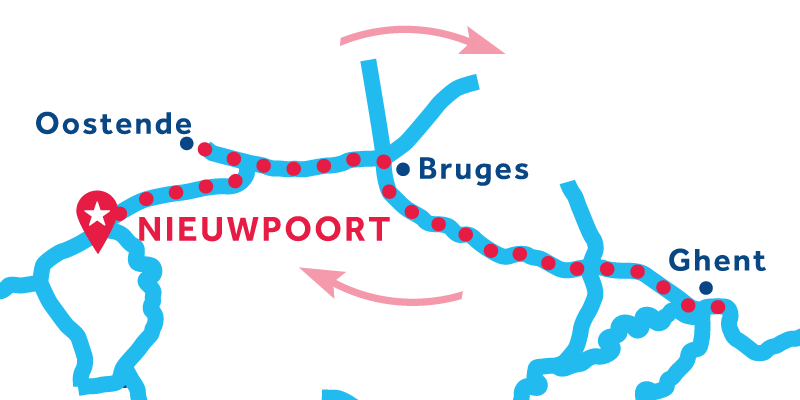 Additionally, they were closing bridges for repair around Brugges and if someone in Brugges had not told us, we would have been trapped on the wrong side of the bridge when we needed to return toward Nieuwpoort. When we asked the woman at the LeBoat counter a recomendation for eating somewhere along the route to Brugges,she said she did not live in the area. There really should be better information for the travelers who are new to the area and most importantly LeBoat should keep current information on all bridge openings and closings which is vital to the travel. Other than these difficulties, we had a very good time. The boat was clean and the personel were very nice. What we got to see of Brugges was wonderful. We didn't have much time there because of incorrect information about bridge openings and closings in LeBoat book. Below are the options for your selected date. 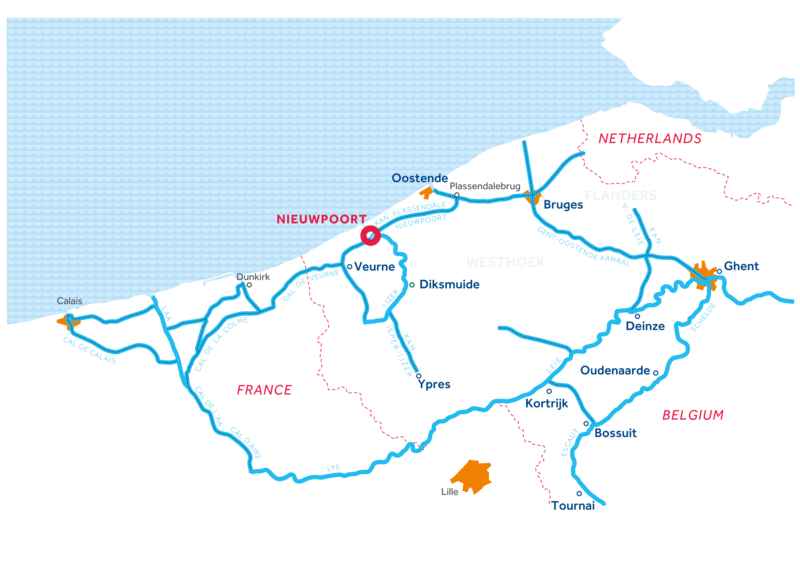 Nieuwpoort is our base in the Flanders region, situated on the coast with access to lovely sandy beaches. From Nieuwpoort, you can head south and visit the town of Leper (6hrs from Nieuwpoort) where many head to pay their respects to those who fell in the Great Wars. Or you can head east where famous and pretty Bruges can be reached in 6hrs, and lively Ghent a further 6hrs cruising from there.